UGG, those again? The infamous—and aptly named—Australian boots have never been easy on the eye, but now there’s a bigger reason for them to weigh heavier on your conscience. Animal-rights group Swiss Animal Protection has uncovered horrifying footage of breeders skinning raccoon dogs alive to make cheap knockoffs of the shoes. Genuine UGGs can cost up to $300 a pair, but counterfeiters are cashing in by substituting sheepskin with raccoon-dog pelts and selling them at cut-rate prices. Despite their name, raccoon dogs are more closely related to foxes, jackals, and domestic dogs than they are raccoons. One animal is shown with its neck pinned to the ground with a heavy boot before it’s flayed alive and tossed onto a heap of carcasses. Divested of skin and fur, it still manages to feebly raise its head. Although the U.K. government banned the import of cat and dog pelts from China in 2001—a Europe-wide ban took effect in December 2008—raccoon dogs are exempt because they’re not considered “dogs.” “There is no U.K. ban on their fur so it’s possible these phony boots could enter the high street,” Jones adds. UGG has denied using raccoon-dog fur in its own products, pointing the finger rather at off-brands for tainting the entire industry. Up to 40 fur-bearing products from overseas contains the word “ugg,” according to Lena McDonald, who heads the company. “We have seen companies cutting off tags saying ‘made in China’ and putting on a ‘made in Australia’ tag,” she says. Not that sheepskin is less barbaric, of course, even if you believe that UGG acquires them humanely. Whether your UGGs are genuine or ersatz, made in Australia or imported from China, your moral mileage may vary. Torture and murder is where we draw the line, however. I didn't have the stomach to watch the video, but the description alone outraged me. This is an abomination. I can't stomach this. I love animals and I know people says raccoons are pests or rather raccoon dogs, but they are beautiful and amazing as are all animals. That baby lifting it's head just made me bawl. I do not think wearing fur is right nor is it worth losing the precious animal life we have on earth. Do they not see the pain and suffering going on in the eyes of these creatures? Do they not have hearts?! I have put a comment up on the UGG FACEBOOK PAGE, They need to step up and help the protection of these animals - they started a trend and now counterfiet copies are the problem the alive!! Its not just raccons , Yeaterday I saw the savage skinning of a live alsatian whilst her puppies wimpered in a corner!! HORRIFIC!!! What else can we do to stop this. i tried to watch the video i turned all the sound off pressed play and quickly scrolled down past the video to read a comment before really watching it but as soon as i scrolled back up to see the video i saw one the one of the dogs clinging to the cage gate holding on for dear life and it was then that i just lost it i stopped that video right then and there and i just .... i just couldn't even do it! oh my goodness! i mean if they killed them quickly and got it done and over with and then skinned um it would be sad but not as bad and that would be a different story but to do this thing alive! no way that's just plain wrong! I have no respect for humans that do not respect animal life. It's as important as ours. We are creatures of the earth. We DO NOT own the earth. whoever has the compassion and power to stop this please ACT NOW. These are being sold on IOFFER and fake websites!!! Everyone must write a letter of disgust to the chinese ambassador His Excellency Ambassador Liu Xiaoming Chinese Ambassador to the UK Embassy of the People's Republic of China in the UK 49 Portland Place London, W1B 1JL This must stop now!!!! And people must be warned!! I personally have a fine line with things, and skinning is one thing (Even though I would rather it not be done), but skinning them alive is another. How hard is it to kill the animal before skinning it (or doing anything that would cause it pain and result in its death anyways)? Seriously? I seriously, I want someone to skin one of the guys arms and see how he likes it. This is so sick, I've read many articles on this story and they have all made my stomach drop. How can any human being do this to any animal the go home and sleep at night? I can't understand how people can live their lives knowing they have put an animal in such distress and pain. Something needs to be done about this, especially in countries like China where it is exploited the most. I'm sixteen and It is my ambition in life to give every animal I possibly can the best life they deserve, abusing animals is cowardly and unnecessary. Hopefully in the future it can be prevented. I'm sure this is very similar to a video I saw on Facebook last night. I'm certainly not going to watch it again to check. I couldn't sleep either knowing the agony those animals were going through. We are customers of Cabela's, but I told my husband we would never shop there again if I find out ANY of their fur comes from China. We hunt, but like someone mentioned earlier, skinning something alive crosses the line. That was the most horrible thing I had ever seen. If anyone knows for sure or could help me find out about where Cabela's purchases their fur, I would be grateful. It's especially horrific that people are laughing and watching this whole tortuous action! I have chosen to buy absolutely nothing from China until this activity stops. Please note that some of your frozen and canned vegetables, fish and shrimp come from China. Green Giant, Birdseye and some others as well. The only way to stop this is to refuse to buy anything from them, not just the fur. I read the warning "GRAPHIC" but was not prepared for the horror that unfolded on the screen before my eyes !,I was curious and sceptical,that this could be true in a supposed civilised modern world ?? the cruelty i watched (for approx 25/30 secs)was the worst sickening display of evil i have ever seen.This left me overwhelmed with a feeling of total helplessness and anger at this poor animals incredible ordeal of suffering,WHY ?WHY?,WHY ?these people may need the money,but they have the choice how ?.I would gun them all down without mercy...These tortured creatures need our help ! ! ! somebody,somewhere action is needed now STOP THIS !. Big deal. Those things (raccoon dogs) are friggin everywhere. They are invasive species, brought to Europe from East Asia. Do we need them here? NO. UGG, those again? The infamous�and aptly named�Australian boots have never been easy on the eye, but now there's a bigger reason for them to weigh heavier on your conscience. 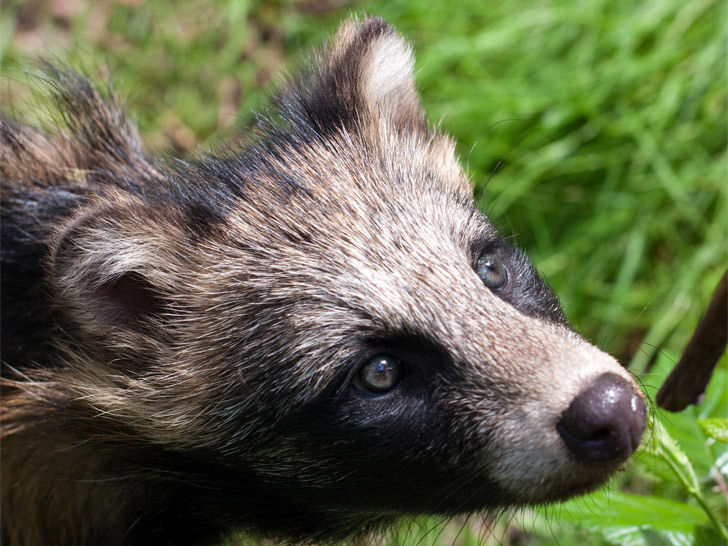 Animal-rights group Swiss Animal Protection has uncovered horrifying footage of breeders skinning raccoon dogs alive to make cheap knockoffs of the shoes. Genuine UGGs can cost up to $300 a pair, but counterfeiters are cashing in by substituting sheepskin with raccoon-dog pelts and selling them at cut-rate prices. Despite their name, raccoon dogs are more closely related to foxes, jackals, and domestic dogs than they are raccoons. One animal is shown with its neck pinned to the ground with a heavy boot before it's flayed alive and tossed onto a heap of carcasses. Divested of skin and fur, it still manages to feebly raise its head.